Chicago is a food city unlike any other. You can walk through downtown Chicago and dine on world renowned, culinary masterpieces. You can also get off the beaten path and really take in some of the hidden gems that the city has to offer. Today we are going to be talking about cheese fries. Nominally, you would think that Wisconsin is the place to go for cheese-laden delights, but not for this dish. Nobody does greasy and cheesy quite like the Windy City. Keep on reading as we discuss a few of our favorite spots for cheese fries in the city. To start off our cheese fry tour we are heading to River North to take in a meal at the Shake Shack. Shake Shack started off as a little hot dog cart in Manhattan over a decade ago before growing into a greasy food powerhouse. The cheese fries here are cheap, crispy, and absolutely bathed in delicious melted cheese. 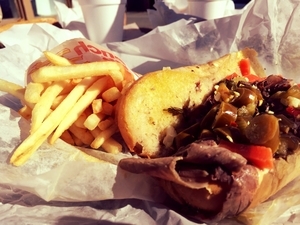 Pair it up with the Shack-cago Dog for a delicious and affordable lunch, just under $10. If that doesn't do the trick we suggest taking a cab down to West Montrose Ave in order to grab a plate of fries from Susie's Drive In. Here you'll find classic Polish fare with an All-American twist. The cheese fries here are local legends and they are served in a gigantic fried taco shell. Don't ask why, just know that they are good. The best part about Susie's? They are open 24 hours a day, 7 days a week. If we're being honest, it's hard to do cheese fries wrong. With that being said, we can definitely tell the good from the great. For a great plate of cheese fries we suggest heading down to local favorites, Buona Beef. Buona Beef has a smattering of locations in and around Chicago. If you want a plate from the first establishment in the area then you are going to want to drive down to Berwyn for your lunch. The fries here are fried to a perfect golden crisp and the cheese topping does the city proud. What we love most bout Buona Beef is that they've been a source of local pride ever since putting their stake in the ground over 30 years ago. Let's change gears a little bit and head to Handlebar on West North Avenue. From the outside looking in you wouldn't expect this place to have delicious cheese fries, but oh do they ever. We suggest ordering up a dish of the Chili Cheese Fries. You'll get to enjoy an ancho-spiced dish of vegetarian goodness. If you like thick, crispy, hot, and gooey fries then this is your order. Handlebar is an all vegetarian, completely made from scratch, slice of goodness and they've been in business since 2003. Now, if you want to go even more upscale then you need to hit up Au Cheval. Located on West Randolph, Au Cheval is the place to go for a fancy meal. Here you can get a plate of fries with an egg on top and a side rack of mornay sauce. Yeah, we definitely suggest putting your pinky out when biting into this dish. This egg-crazy, classed up diner has been in town for years and features some of the most creative dishes in the city. We fall in love with the culinary world that Chicago has to offer after almost every single meal. You can order a Michelin Star meal on one side of the street and then get a plate of gooey, crispy, delicious cheese fries on the other. We've listed five of our favorite cheese fry spots in the city, but there are more out there just waiting to be discovered. Are you up for the culinary quest of finding them?